1. 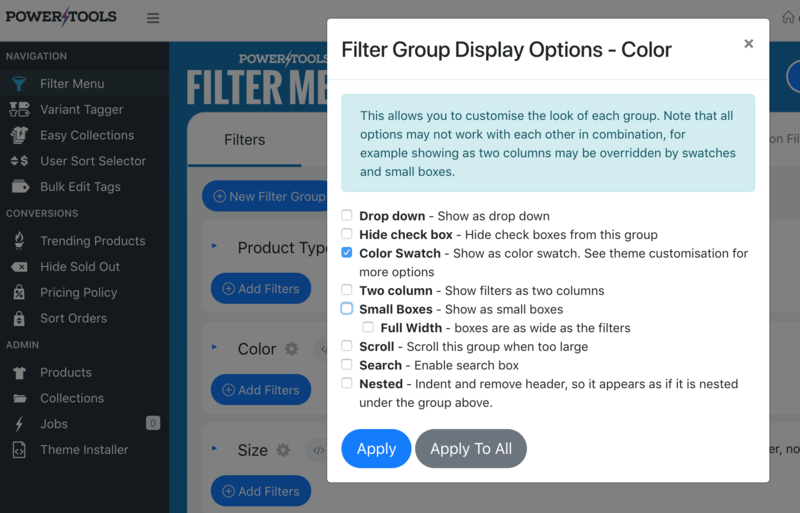 In your Filter Menu admin, click on the 'Display' button next to the color filter group and set it to 'Color Swatch'. You can set custom colors in your Shopify Admin ->Online Store ->Themes ->Customize ->Sections ->Filter Menu ->Add Content ->Color Swatches. If you are not seeing the swatches, check to make sure that checkboxes are enabled in the Shopify Admin -> Online store ->Themes ->Customize ->Collection page ->Theme Settings ->Filter Menu ->select Swatches.